Theo is the god of war and, despite some sibling rivalry, he is in his element as three nations are pushed towards destruction. War is all he has ever known, until a chance encounter with a young girl changes centuries of ambition. The narration of this story is split equally between Theo, a god who looks about 17 years old, and has been influencing wars and conflicts for centuries, and Cassia, a 16-year-old girl whose family were victims of the current Kisk war. This book is suitable for older YA readers, as it starts with the sacrifice/murder of Cassia, and contains sexual themes later on. 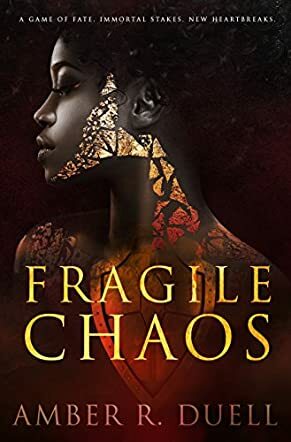 Fragile Chaos is set in a world similar to ours. It echoes the decline of religious devotion to the gods as humans become more advanced and sure of themselves. The gods are original creations by Amber R. Duell, although they remind me of the Greek gods – a family of powerful beings that can be petty and underhanded, carrying feuds for all time. This setting felt like something new and intriguing, but faded into the background to allow the romance to take centre stage. The story focuses on the growing attachment between Cassia and Theo, who shouldn’t like each other for a variety of reasons, but can’t deny the attraction between them. I liked the relationship between the main characters; it just hooks you in and pulls you along effortlessly as you wonder how this will ever work out. This book will be very popular with YA readers looking for their new immortal crush.